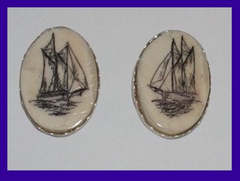 A classic set of scrimshawed Fossil Ivory post earrings set with a Sterling Silver bezel and full Sterling Silver back. Choose from one of our four classic shapes and sizes shown below; then choose your own etching, as well as the type of ivory you prefer. picture of your choice for a commission price quote.